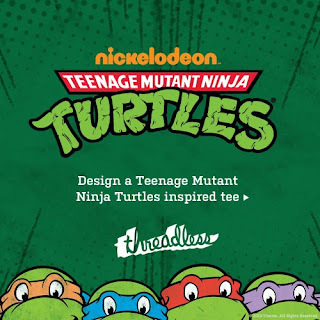 Threadless and Nickelodeon have announced a T-shirt design contest where you get to pick the winner! You have from now until April 15, 2013 to submit your design. The submitted designs will then be posted for community voting. The winner wins money and pizza! All of the details are over on Threadless.com. Get drawing! Tired of seeing the same stock art over and over? 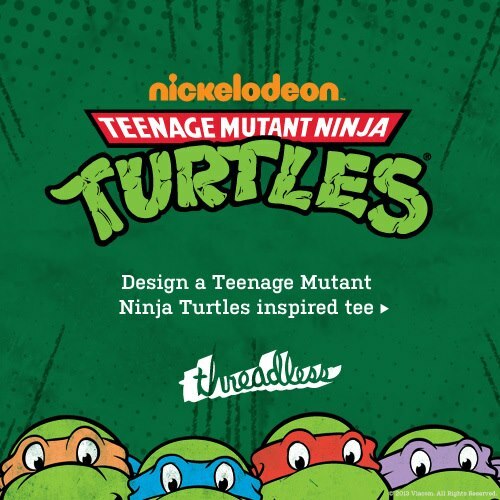 This is your chance to create a truly unique TMNT T-shirt! Ladies! Tired of tolerating the male-targeted shirts? This is our chance to create something flattering and geeky! 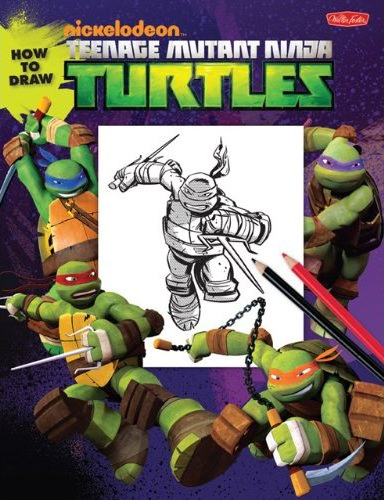 When you're done, share your submitted design on the Ninja Pizza Facebook Page! The fine folks at TVStoreOnline sent me this awesome hoodie to show off to you guys. So, here's me being a dork. Click here to get one of your own! 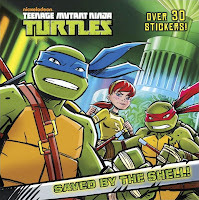 As the debut of the new Teenage Mutant Ninja Turtles cartoon series from Nickelodeon draws near, expect to start to see a new wave of merchandising hit stores. Early signs of the new merchandise have started to hit the Internet, in this case in the form of book pre-orders available on sites like Amazon.com. You can check out some of the cover art below, and hit any of the title links to reserve them now. And many, if not all of the titles, are eligible for a buy 3 get the 4th free promotion on Amazon! 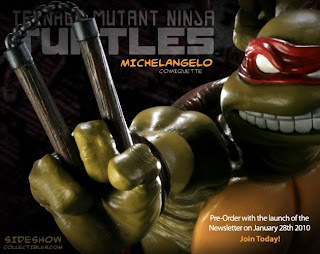 The Michelangelo comiquettes from Sideshow Collectibles are now available for pre-sale. Unlike the previous two pre-sale events, both the exclusive edition and the regular edition are concurrently available to order. 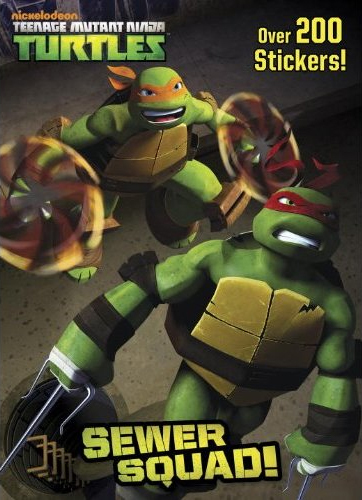 The exclusive edition features Mike in his trademark orange bandanna, while the regular edition has him in classic red. You can click your preferred flavor (or both!) below to place your order. Hey there, folks! It's been awhile since we visited. 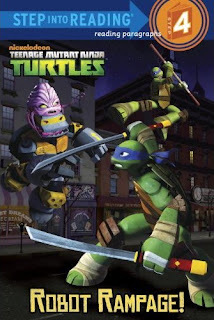 Truth is, there hasn't been much in terms of TMNT news to report (specifically, none). Further truth is that this will probably be the case for the foreseeable future, as things are still in flux with the whole Nickelodeon thing. 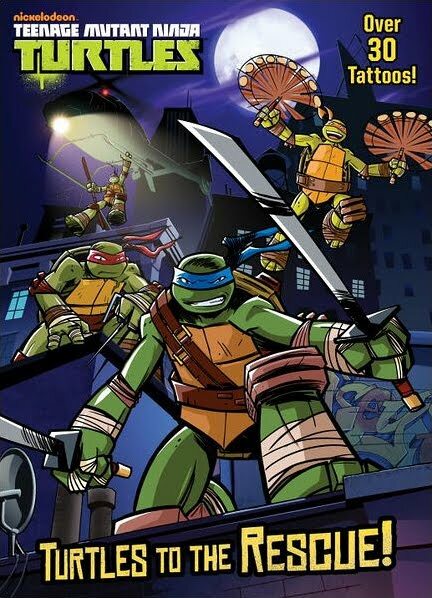 Also, I've been a little lazy, but I do have some TMNT Flashback features planned that I hope to use to supplement all this down time. 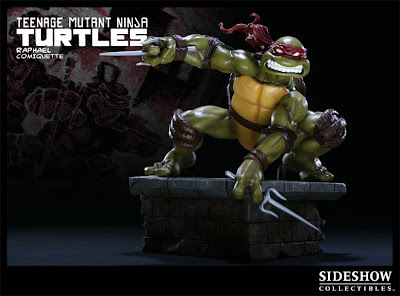 Mike will go on sale with the launch of the January 28 Sideshow Collectibles newsletter. Be alert, as that exclusive edition is likely to sell out within an hour or two! 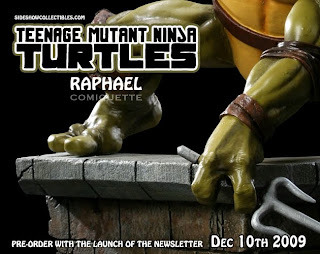 The exclusive edition of Sideshow's Raphael comiquette has sold out. If you missed it, you still have a chance at getting one if you get on the Wait List ASAP, or you can simply opt for the regular edition. Either way, you don't want to delay! 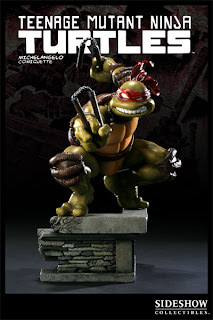 Sideshow Collectibles' Exclusive Edition Raphael Comiquette is available for pre-sale RIGHT NOW. These won't last long, so grab it now! 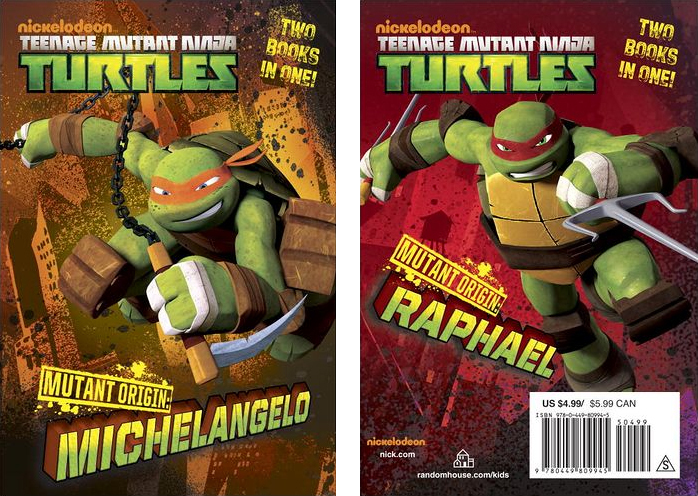 The exclusive edition varies from the regular edition with the inclusion of a switch-out hand with duel summons (as seen in TMNT Vol. 1 #1) wrapped around a sai. 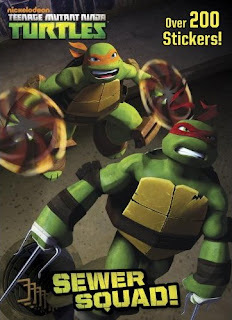 And if for some reason you're still wasting your time here, go get Raph now! 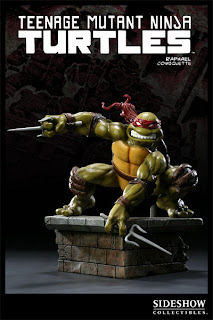 Sideshow Collectibles has released the first preview image of their next TMNT comiquette, Raphael. The statue will go up for pre-sale on December 10 with the launch of the weekly newsletter. 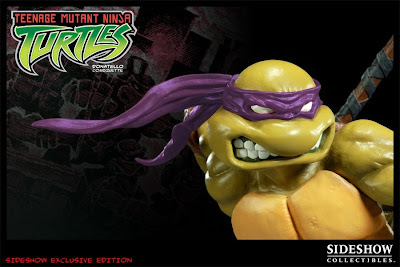 Sideshow also revealed that the edition size of the regular edition Donatello comiquette has been set at the low, low number of 600 pieces. The exclusive edition Donatello comiquette, which features interchangeable red and purple bandannas, is set at 425 pieces. Both editions are sold out, but if you get on the wait list(s) ASAP, you may still have a chance of owning these amazing collectibles! Of the four TMNT statues Playmates released several years ago, Michelangelo is probably the easiest and cheapest to find. 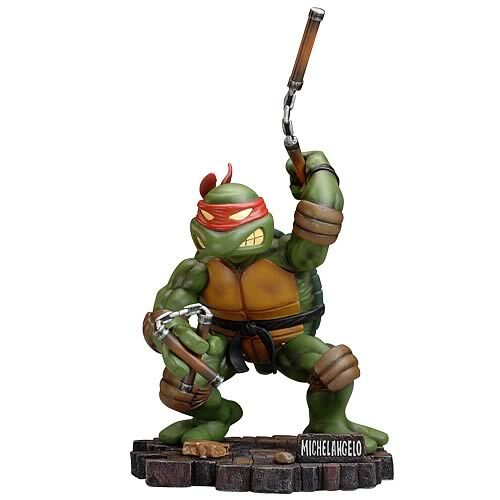 But it's only a matter of time before the supply runs dry and he becomes as coveted as the Raphael and Donatello statues from the same series. As part of their Black Friday campaign, Entertainment Earth is currently selling the statue for only $50! That's a steal you don't want to miss out on! 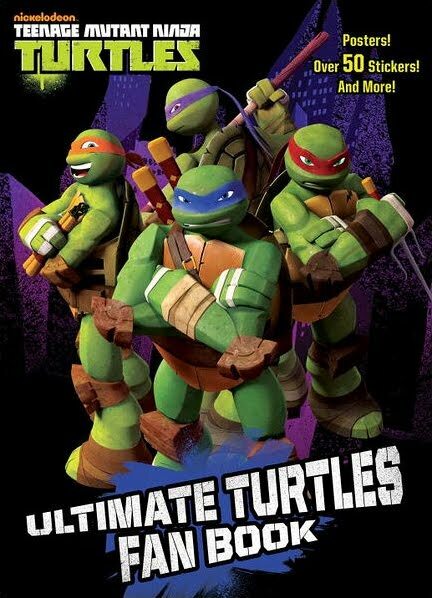 Thanks to TMNT fan Spitfire for the heads-up. Ryan Brown's alma mater, Norwayne High School in Creston, Ohio, is selling an exclusive Teenage Mutant Ninja Turtles shirt to benefit their arts programs. The shirts are also available at the middle school in Creston, and two elementary schools, one in Sterling and one in Burbank. 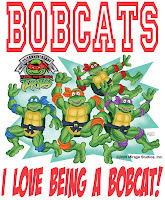 Their mascot is the Bobcat, hence the phrase "I love being a Bobcat!" on the shirt. Unfortunately, the shirt isn't available online or to the general public, but it's still great to see an effort like this to support the creative arts. As an alumni of my school's band program, I know first-hand just how neglected all of the arts programs can become when schools aren't able to budget properly. Good luck to Norwayne High School and all affiliate schools! 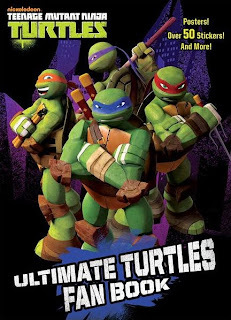 Best TMNT Deal on the Internet!! 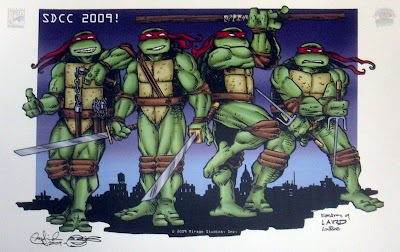 If you aren't familiar with mega-TMNT fan Tokka's artwork, you should be. 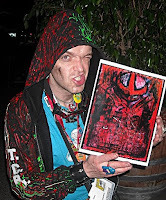 Not only is he the biggest TMNT fan around, but his artwork is the most unique and equally fantastic you're gonna find. 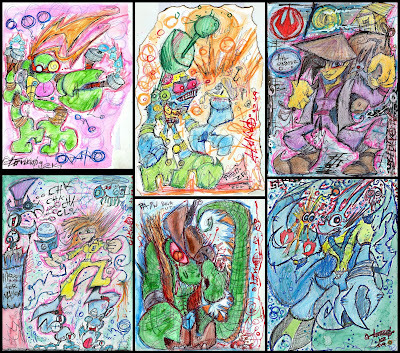 If you've ever wanted a piece of Tokka's art for your very own, now is the best opportunity ever to get it. He is currently offering his promotional 1-inch buttons to anyone who wants one, completely for free (plus shipping). If you make a donation to Tokka in addition to the shipping cost, he'll send you a piece of art done to your request along with your button! $10 donations are standard sized illustrations on Bristol! Remember to include in your PayPal note what TMNT character you want and/or what you want sketched. Offer is only good through Halloween, so don't delay! Tokka is going places, and this is your best chance to get a piece from him before prices skyrocket! If you weren't aware, his art has already been published as the pin-up page for Tales of the TMNT Vol. 2 #48!! 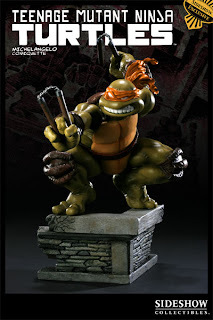 Sideshow Collectibles' Donatello Comiquette Now Available For Preorder!! The item isn't due to ship until the 2nd quarter of 2010 at the soonest. That gives you at least 6 months to save the money, since you won't be charged for it until it ships. It is likely to sell completely out. The exclusive edition was sold out within an hour of being available on the site, so the regular edition isn't likely to stick around for too long either. Um, seriously, what reason do you have to not pre-order? Going back to bullet #2, let's discuss the exclusive edition vs. the regular edition. The exclusive edition of any Sideshow product is more limited in production size and also includes an exclusive feature (hense the name) not available with the regular edition. 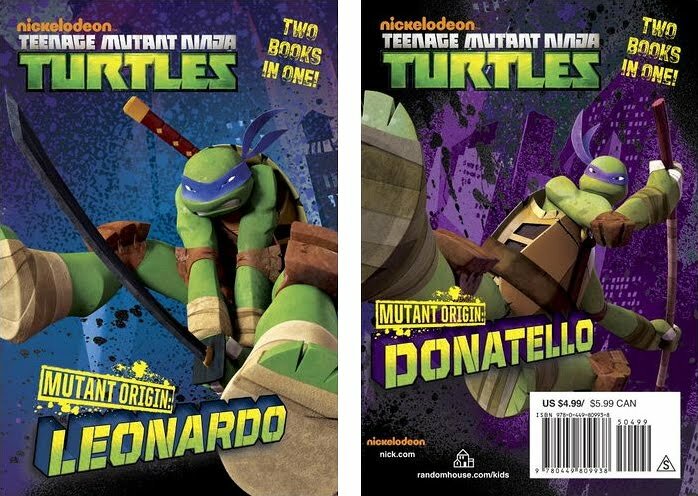 In the case of Donatello here, you get the option of either swapping out his mask to be red like in the comics, or purple like in... well, everything else. If you want purple, you'll have to get an exclusive edition. "But how can I get purple if it's already sold out?" you ask? Get on the wait list! NOW! Orders get canceled and Sideshow has a fantastic system in place to fill those orders for people who indicate that they want a particular sold out item. This list works! In fact, I don't think I've ever not gotten an item I went on a wait list for. But the sooner you do it, the better your chances. So that's it! Click any of the pretty pictures to be taken to the corresponding order page. 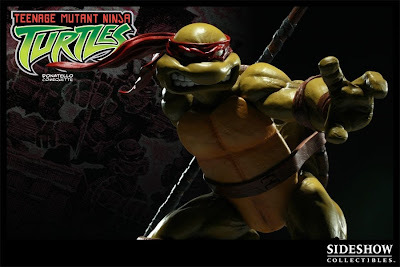 With Thursday night's weekly newsletter, Sideshow Collectibles revealed the preview for the upcoming Donatello comiquette statue, the first in what is sure to be a series of at least four statues. 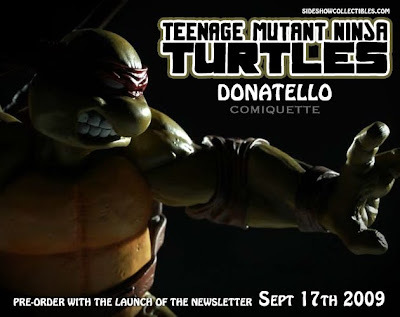 As stated on the graphic, Donatello will go up for pre-order when the newsletter is released on September 17. If you're not already a subscriber to Sideshow's newsletter, you can easily do so on their Web site. And if you're not familiar with Sideshow and/or have never ordered from them before, I definitely recommend that you get your pre-order in ASAP once you can. Better safe than sorry, even if you have to cancel the pre-order for whatever reason before the item ships, which will be at least several months from now. This picture has been circulating for over a week, but it hit FAIL Blog today, so I decided I'd post it. You can also Digg it. Hopefully we can all use this as a lesson for why unnecessary text should be kept off of merchandise (all of the recent T-shirts suffer from this, too). "Scratch Attack" Jake Black Benefit T-Shirt! As you should know by now, occasional TMNT writer Jake Black is currently fighting Hodgkins disease (i.e. CANCER). And that means a lot of big ugly medical bills. 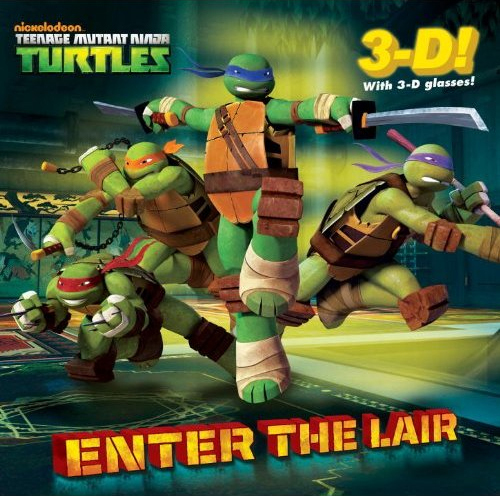 To help Jake out, his pals at Mirage Studios have been selling some Turtles wares, the proceeds from which go to pay those bills! 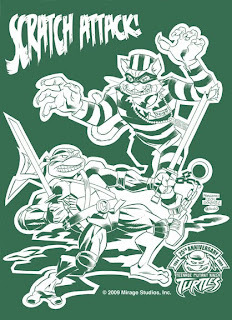 The latest of these sales is a T-shirt featuring the cat burglar Scratch facing off against Leonardo, by Fernando Leon Gonzalez and Ryan Brown!! The shirt looks GREAT and everyone needs to go buy one!! That means you! 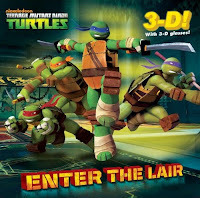 Hit up NinjaTurtles.com for all the details! 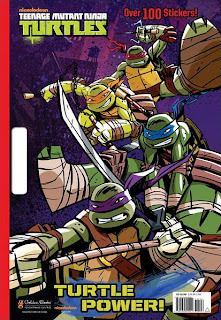 While it was not an unexpected announcement due to Sideshow's participation in the button run that helped you win a ticket to Friday night's Galabunga party, it was an announcement that sort of fell under the radar during the busy Comic-Con weekend. But I managed to keep on top of it for you. Here's the short announcement that happened during Sideshow Collectibles' panel Saturday evening. I've replaced my shaky handy-cam video with the video since released on Sideshow's Web site. And since the audio at the end is hard to hear, I've provided text balloons. Yes, the headline is true! You might have thought it would take hell freezing over for the two co-creators of the TMNT to get over their apparent irreconcilable differences and collaborate artistically once again. But no, it didn't take that, it took a much more unfortunate reason. You see, my pal and occasional TMNT writer Jake Black has the Big C. Yeah, that's right: Cancer. The good news for Jake is that the specific type of cancer he has is Hodgkins Lymphoma, which has an extremely high cure rate. The bad news is that being extremely treatable doesn't make the treatments any less sucky and it doesn't make medical bills any less expensive. He's already won a battle with his insurance company to get them to cover his treatments, but you know they're not covering anything. And on top of that he's still got a wonderful family to support, which isn't as easy to do when you're sick and can't work as much as you're used to. That brings us back to the headline. 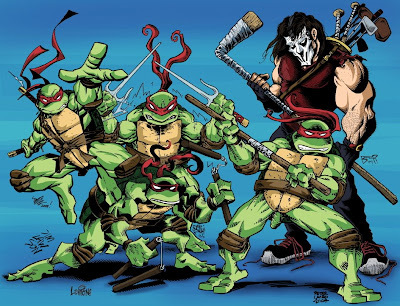 Kevin Eastman and Peter Laird have collaborated to create a commemorative art print, the sales of which will go to Jake's medical bills! I'm pretty sure that Kevin and Peter haven't collaborated in this form since the mid-90s and, honestly, the chances of this happening ever again are rare at best. What does that mean? It means you need to get yourself one of these!! How do you get one? For now, you have to be attending San Diego Comic-Con next week. They will be for sale at the Mirage tables in Artists' Alley for the (extremely reasonable) price of $25. The edition sold at Comic-Con is limited to 100 pieces, but if you miss out or can't make the Con, don't fret too hard, it sounds like a non-Comic-Con edition of the print will eventually become available. Jake reports that there are also plans to put the image on T-shirts and posters. The current Mirage crew collaborated on a print, also for Jake's benefit, that was first sold at a Free Comic Book Day event back in May. This print will also be available at Comic-Con next week for $20. 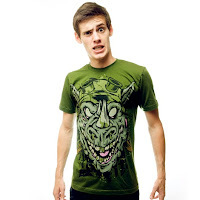 Electric Zombie clothing has released a new line of TMNT-inspired T-shirts. The T-shirts feature original designs that harken toward everyone's love of zombies. There is also a (not-so-original) poster. Most of these styles are super-limited, so get them NOW if you want them! Thanks to @CoreyMadVillain on Twitter for finding this! "I just wanted to send over an image of our SDCC exclusive for this summer. 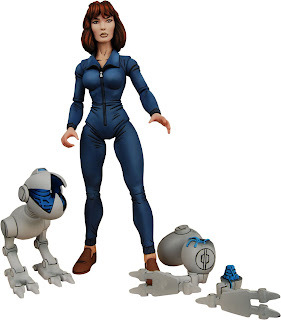 It will be a brand new April O' Neil figure that comes with a Battle Damaged Mouser and a Regular Mouser with a new head featuring an articulated jaw.